Rotherham Clifton had injury problems and gave ‘Ensians a walk over into the quarter finals where they will play Old Modernians away on December 20th. 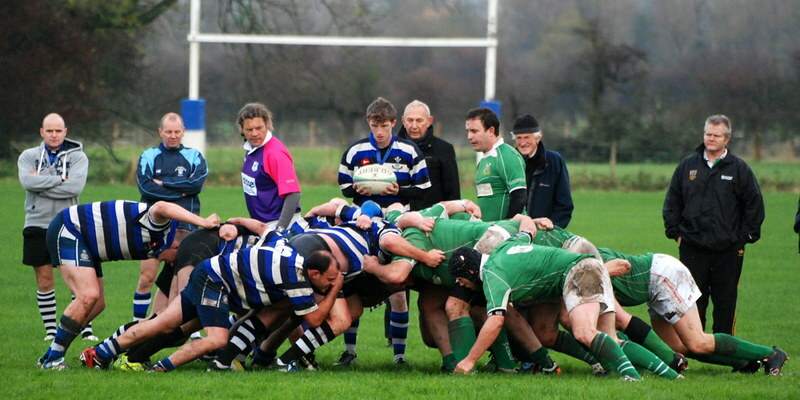 Ensians 2nd xv played a most attractive merit league match against Wharfedale 4ths where a total of 13 tries were scored. Heavy rain had stopped leaving the pitch quite wet but in the absence of any wind, conditions were good. Straight from the kick off Wharfedale opened out the ball to score an unconverted try in the corner. The home team were going backwards in the scrums and the visitors were a well drilled team but despite firm defence where Ross Nicholls and Ben Smith were to the fore the visitors scored three more tries [one converted] to make the score 22 points to nil after 25 minutes. However, the ‘Ensians team linking with Otley Viscounts for the match became more cohesive and began to take ascendancy .After 35 minutes following a fine touch kick Ben Smith gained good lineout ball ,the ball was moved to Declan Jackson, and he outpaced the defence to score a try converted by Matt. Tenniswood. Better was to follow one minute later when following good work by the forwards the ball was passed to Sean Leddy who outpaced the defence for an unconverted try to make a half time score of 22—12 to Wharfedale. ‘Ensians started the 2nd half where they left off and for the first 15 minutes were camped in the visitor’s half ,Declan Jackson using his speed to score his second unconverted try after the Wharfedale defence had been sucked in .The visitors realised that their best tactic was to keep the play in their heavier pack and as a result came back to score two tries in five minutes [one converted] to make a score of 34—17 to Wharfedale. Not to be outdone the home team fought back with two tries one by Ross Nicholls [unconverted[ using his strength to go over in the corner and the other by Declan Jackson outpacing the defence to score between the posts converted by Matt. Tenniswood. The score was now 34—29 to Wharfedale with ten minutes to go—game on!! Using their forward strength the visitors scored their seventh try [converted]and the home team replied with an unconverted try by Declan Jackson to make a final score of 41 points to 34 points in favour of Wharfedale to earn the home team try scoring and losing bonus points and to give the visitors a hard earned victory.